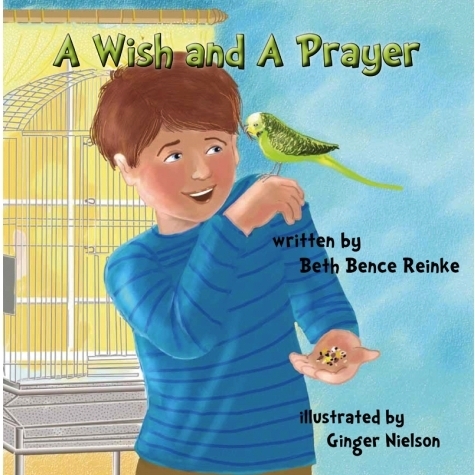 A beautifully told book to help teach children about faith is what you’ll find in A Wish and A Prayer by Beth Bence Reinke. Jason is sad when his pet parakeet is scared by an ambulance racing by and takes off out the window. His friends try to help, telling him all about making wishes by waiting until the clock says 11:11, dropping a penny in a fountain, or even using stars. When Mom asks him who hears those wishes, Jason begins to think that praying for Sonny’s return would be a better idea. I truly enjoyed how Reinke tackled the difference between wishing on objects versus praying to God for our needs. The message is given to the reader in such a way that it is easy for him to understand. In addition, as when Jason discovers without electricity the clock has no power at all, your child will realize that God has power in any situation. The other nice thing, which parents will pick up more than children, is the peace that comes from casting your burden unto the Lord. Once Jason prays, he feels a song in his heart as he drifts off to sleep. Believers know the peace that passes all understanding, and will find A Wish and A Prayer gives them a simple and subtle way to share that concept with their children. Artist Ginger Nielson did an excellent job on the illustrations for this book. She also provided the artwork for In My Bath, the other book by Reinke, which we reviewed here. I hope their collaborations continue. A Wish and A Prayer will make a lovely gift any time of the year. With its lovely story and stunning artwork, your child will be reading it over and again. This is a lovely book with a gentle message. Nice review, Cheryl. You’re so kind, Beverly – thank you. And Cheryl, I appreciate your lovely, insightful review. I appreciate this review so much! It is wonderful when reviewers take the time to acknowledge books that can make a difference in the life of a child. Sounds like a wonderful book, can’t wait to read it. Thanks for sharing. A Wish and a Prayer as well as In My Bath sound like good books for my grandsons! They’re on my Christmas gift list. Thanks for sharing the great review!